One of my favourite back to school reads is Robert Munsch's We Share Everything. We Share Everything is not fine literature. The illustrations are not fine art. 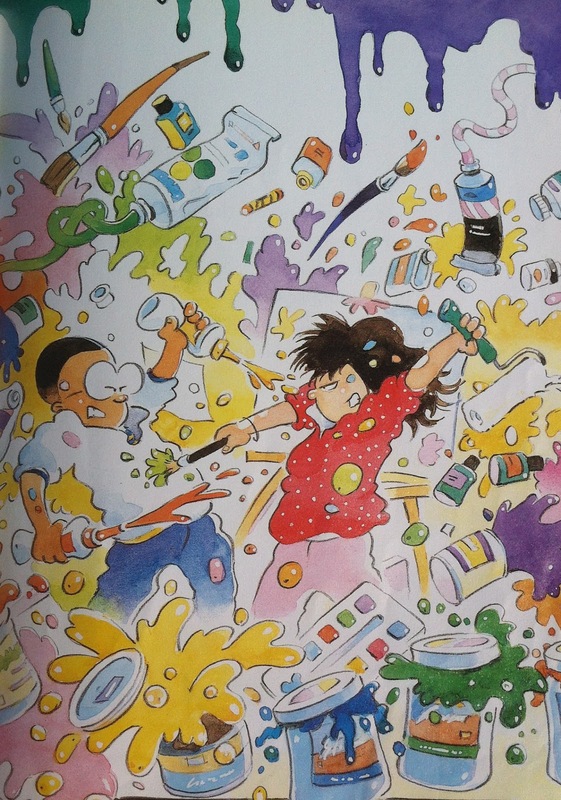 But the Munsch-Martchenko team created a fine, readable story, built on trademark Munsch repetition and a twist to the ending and Martchenko's quirky madcap cartoon-like illustrations. Maybe not a critic's choice, but definitely a kindergarten favourite. 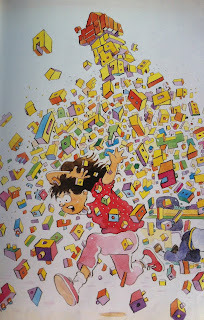 I love We Share Everything because it is a fabulous read aloud. A great class participation read. Before we start reading the book, we all practice the refrain. "In kindergarten we share. We share everything!". Hopefully you can hear the intonation and see the arm movements. 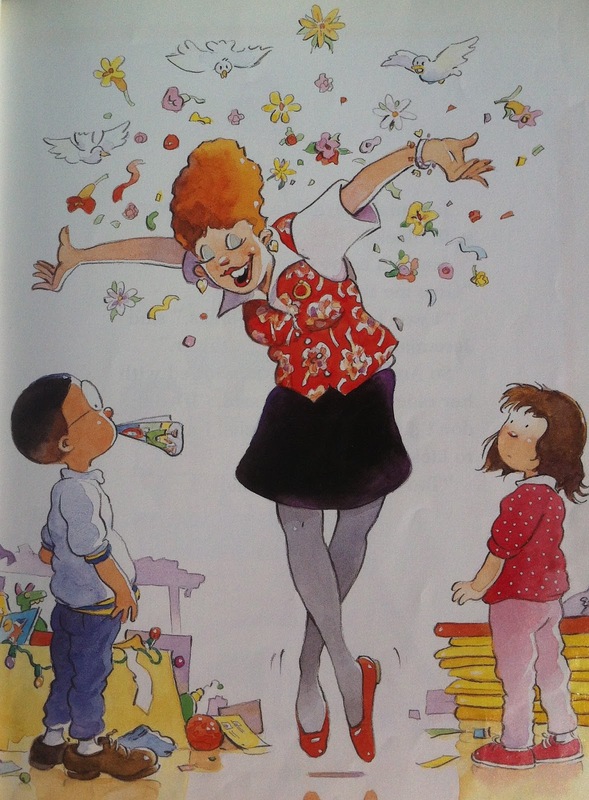 Then we practice the kindergarten teacher flutter. It's a two-handed flutter. With a smile on . 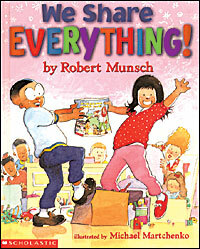 Listen to Robert Munsch tell his story [here]. Amanda and Jeremiah have a dispute over the blocks. Sounds like a good time to talk about how we play with the blocks. Then they need a wee bit of guidance at the paint easel. An opportunity to discuss paint etiquette. Sharing is a year long discussion in kindergarten. It's a biggie. Might as well start the conversation right away. While I think that We Share Everything is best just read and enjoyed, there are some free resources to use with the book. The Picture Book Teacher Edition created a draw and write page to use in response to the book. 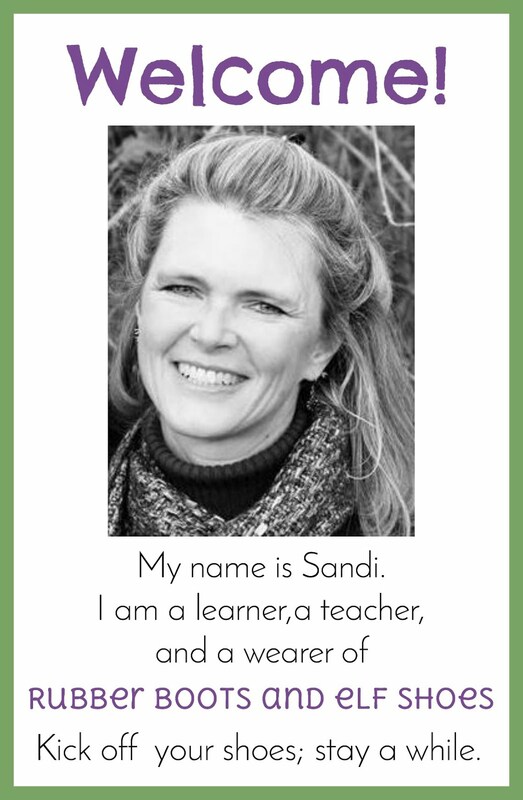 Click the graphic to go to Shauna's blog. 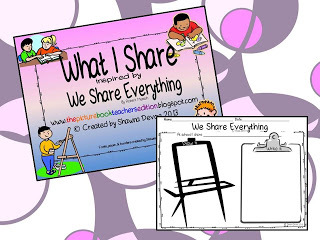 Mrs Larremore at Chalk Talk made a We Share Everything class book with her kidlets. 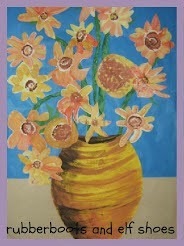 Click on the title page picture to link to her blog. The last thing I'm going to leave you with is a couple of songs about sharing. The first from Raffi, the children's troubadour who has been championing children's rights, and writing and singing songs for children for over 20 years. I am a Patron of Reading (I have a link up just after yours on the blog hop page) and I am always on the lookout for book suggestions so your post is perfect. How wonderful to be a Patron of Reading, helping children enjoy stories, books and reading. Thank you so much for stopping by - and leaving 2 comments. Thanks for the review. 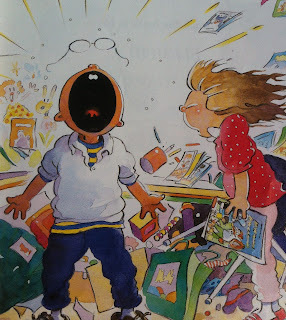 Books about sharing are precious. What a valuable lesson to learn. This one, as are all Robert Munsch books, is hilarious. Maybe include it in your next Literacy Day at your school. You sent this book to me! I love it. I think your grade ones will love it. They can feel oh so grown up, not at all like the "little kids" on the first day of kindergarten! Sounds like a delightful book. Books on sharing at this age make a big impact I think,so this book was an excellent find. I also like the draw and write page, where kids are asked to think about sharing and what they would share. This book is timely for me, since our 2 1/2 year old is learning/not learning how to share! I love that you can listen to the author tell the story - thanks for sharing! I hope that you enjoy it with your wee one. It's a great read aloud. Great post, great book! Thanks for sharing my link!! It is a fabulous book - my kids love it. Always happy to share links to other people's freebies. Don't promise that reading the book will get kids sharing - but it is a fun read. So timely! Loving your posts. I love reading We Share Everything at the beginning of the school year, since it is such a great book for participation reading. It really builds a sense of being a fun community. Looks like a great read! 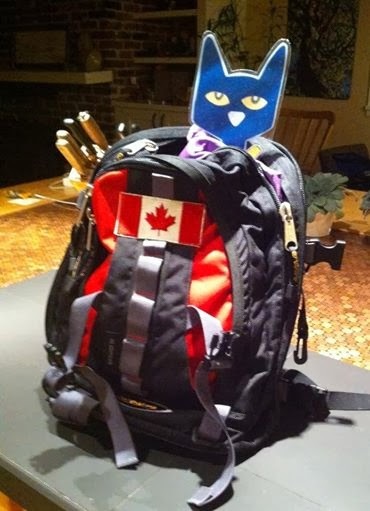 Max is not ready for kindergarten yet, but we could use some thoughts on sharing with the kids in our neighborhood. Max and his best friend love each other but they ALWAYS want the same toy. ALWAYS! Thanks so much for linking in! 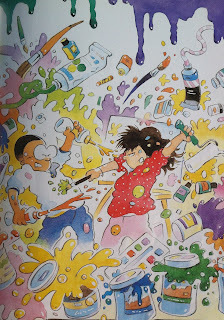 The Munsch/Martchenko team really makes some books that kids love to have read to them, don't they!? My favorite Munsch book, Ribbon Rescue, is actually illustrated by Eugenie Fernandez (here's my review of it: http://mommynificent.com/2012/10/06/ribbon-rescue-book-review/) but there are so many from this duo that we really enjoy! I haven't actually seen this one yet, so I'll have to keep an eye out for it! Thanks for sharing it at Booknificent Thursday! Looking forward to seeing what you have to share this week!